Made of painted California cedar wood. Brass ferrule with replaceable erasers. 12 pencils, length 20 cm, unsharpened, in a telescope box. Manufactured in Japan. Blackwing 602. Grey shank. Hardness grade HB. Good for writing and line drawings. Blackwing Pearl. White shank. Hardness grade 2–4B. Softer, fuller line, good for writing and free-hand drawings. Blackwing. Black shank. Hardness grade 4–6B. Very soft, deep black line, for sketches, but some prefer it for writing. The Cult Pencil is Back. The Blackwing 602. The Blackwing 602 is noted for its soft, dark graphite, unique flat square ferrule, and replaceable eraser. The pencil was manufactured by the Eberhard Faber Pencil Company from 1934 to 1988, by the Faber-Castell pencil company from 1988 to 1994 and by Sanford, based in Oak Brook, Illinois, from 1994 to 1998. When the American producer shut down the production of the Blackwing 602 in 1998, no one suspected that it had attracted a community of genuine pencil enthusiasts. Just a short time after the production stop the remaining stock was in high demand. So another American firm decided to reissue the Blackwing. While the erudite (and not so erudite) inhabitants of the internet are disputing the acceptability of the reissue, we decided to form our own judgement and distributed the pencil in our offices. The verdict returned was positive: The 602 is a formidable tool for writing and drawing and passed our little test with bravado. Besides its growing fan community, there is one deficiency, we don’t care to hide: the construction and quality of the eraser. The ferrule doesn’t hold the eraser tightly enough, so at times it slips when erasing. And because the white eraser does obliterate lines and drawings so much better, we just offer the white one as a replacement. The pencil itself is available in three degrees of hardness: HB (Palomino Blackwing 602), 2–4B (Palomino Blackwing Pearl) and 4–6B (Palomino Blackwing). Half the Pressure, Twice the Speed. In contrast with the original, the Palomino Blackwing 602 relaunch is made of grey painted California cedar wood. Lightly put on paper, its rather soft graphite lead draws a remarkable line. And like the Faber original, the Palomino Blackwing 602 bears the familiar motto on the back: „Half the Pressure, Twice the Speed“. Even if having the motto printed on the writing utensil alone does not speed up the process of writing itself, it sums up the particular characteristics of this pencil. Especially the 4–6B Blackwing glides over the paper and leaves soft, deep black lines in its wake, so it’s the ideal implement for sketches and freehand drawings, replete with shading. At a grade of 2–4B the Blackwing Pearl is midway between a Blackwing and Blackwing 602 and with its soft, full shade is just as good for writing as for freehand drawing. 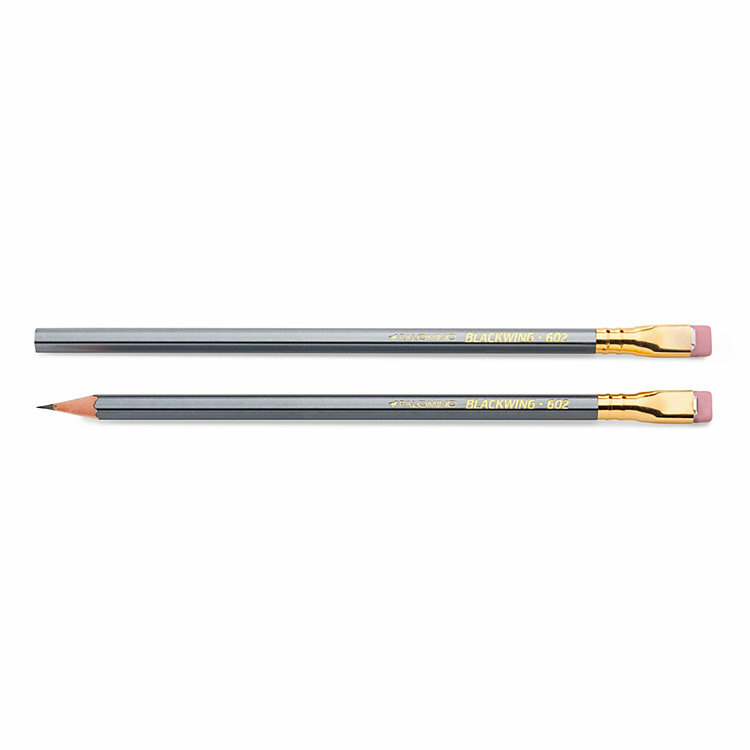 Like the originals, the pencils feature a flat replaceable eraser in a brass ferrule.